A look at five other Nobel Prize winners who share the uncommon achievement of having done their award-winning work as students. 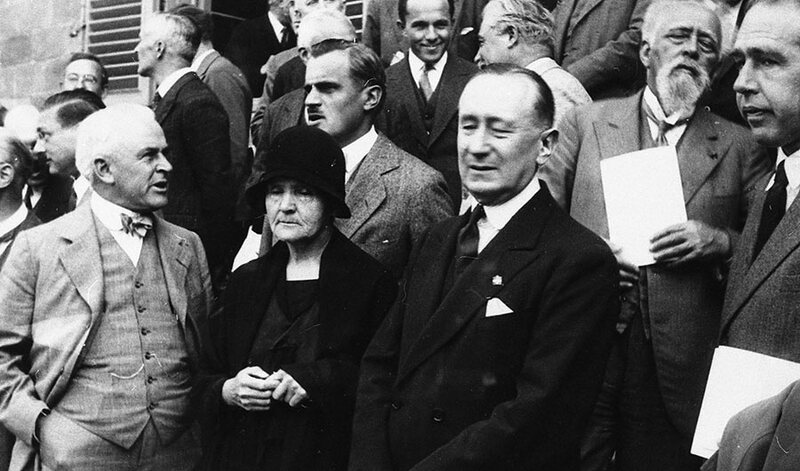 1931 photograph from the Conference on Nuclear Physics in Rome, including, from left to right in the front row, Robert Millikan, Marie Curie, Guglielmo Marconi, and Niels Bohr. Picture also features Arthur Compton, Jean Baptiste Perrin and others. (Inside Science) -- After the 2018 Nobel Prize in physics was announced this week, several stories appeared highlighting the fact that Donna Strickland of the University of Waterloo in Canada did her groundbreaking work while in graduate school. She coined the term "radioactivity"
The superlative list of achievements credited to Marie Curie is too long to describe here. She is the first woman to win a Nobel Prize, the first person to win more than one and the only woman to ever win twice. She coined the term radioactivity, and as a graduate student she isolated the radioactive elements radium and polonium. In 1903, the same year she was awarded her doctorate from the University of Paris, she won the Nobel Prize in physics with two others, her husband, Pierre Curie, and Antoine Henri Becquerel for their research on radiation. Louis-Victor Pierre Raymond de Broglie boldly hypothesized in his 1924 doctoral thesis a flip side to Einstein's coin. Einstein had proposed that light waves could exhibit particlelike behavior, and de Broglie hypothesized, inversely, that particles of matter could have the properties of waves -- so-called particle-wave duality. The wavelike behavior of particles became a cornerstone of quantum mechanics and won de Broglie the Nobel Prize in physics in 1929 "for his discovery of the wave nature of electrons." In 1950, John Nash graduated from Princeton University with a doctorate in mathematics and a thesis that bore the simple title, "Non-Cooperative Games." In it, he laid out the underpinnings of game theory, and in 1994 he won the Nobel Memorial Prize in Economic Sciences with John C. Harsanyi and Reinhard Selten for this work. His mathematical feats and later struggles with schizophrenia became subject of the Sylvia Nasar's book "A Beautiful Mind," which was adapted into a movie that won Oscars for both Russel Crowe and Ron Howard. As unexpected as it was profound, the strange behavior in a sample of the isotope helium-3 at a temperature just above absolute zero was noticed by graduate student Douglas D. Osheroff in the early 1970s. What appeared at first to be a glitch turned out to be a new instance of superfluidity -- where atoms in the liquid move in a coordinated manner and exhibit nonclassical behavior. In 1996, Osheroff shared the Nobel Prize in physics with David M. Lee and Robert C. Richardson for this discovery. Before getting her doctorate from the University of California, Berkeley in 1987, Carol W. Greider and her mentor Elizabeth H. Blackburn discovered an important enzyme called "telomerase." It makes telomeres, which cover the ends of DNA chromosomes to protect them -- not unlike the plastic tips atop shoelaces that keep the fabric from fraying over time. In 2009, Grieder won the Nobel Prize in physiology or medicine with Blackburn and Jack W. Szostak for their discoveries. While Best never won the Nobel Prize, the value of his work for humanity is hard to ignore. Insulin turned diabetes from a death sentence into a manageable chronic disease almost overnight, and it has saved countless lives ever since. What's the Best Way to Learn New Sounds in a Foreign Language?